Washington, D.C. – SUPERVALU INC. today announced that the SUPERVALU Foundation will donate $70,000 to Food & Friends, in support of the organization’s services to people battling critical illnesses in the D.C. metro region. This grant was made on behalf of SHOPPERS Food & Pharmacy, whose employees work with Food & Friends as donors and volunteers. In celebration of this gift, SHOPPERS’ staff will volunteer at Food & Friends on April 20th. This grant is part of the SUPERVALU foundation’s million-dollar effort to provide hunger and food-related relief to those in need in local communities across the country. For Food & Friends’ clients, hunger relief is a key part of nutrition planning to support positive health outcomes. And for clients’ children and caregivers also served by Food & Friends, hunger relief is an important part of reducing stress and supporting the health of the household. This grant will support the preparation and delivery of nearly 1 million meals to 2,600 critically ill clients in 2017. A significant part of this grant will also support nutrition counseling and education for clients, providing them with the skills to better manage their illness. Food & Friends is a Washington, D.C.-based nonprofit organization that provides home-delivered, specialized meals and nutrition counseling to people living with HIV/AIDS, cancer and other life-challenging illnesses. Food & Friends’ services are free-of-charge to recipients, who qualify solely based on their health status and nutritional need. Monday-Saturday, including holidays, staff and volunteers deliver to 5,300 square miles including the District of Columbia, seven counties in Maryland, and seven counties and six independent cities in Virginia. Since 1988, Food & Friends has delivered more than 20 million meals to 30,000 individuals. For more information, please visit www.foodandfriends.org, Facebook (/foodandfriends), Twitter (@foodandfriends) or Instagram (@foodandfriendsdc). 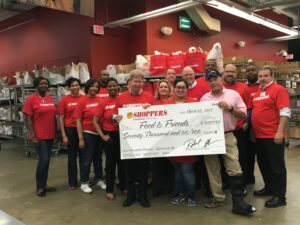 Shoppers Food & Pharmacy, a member of Supervalu’s corporate stores family, operates more than 50 full-service supermarkets in Baltimore, northern Virginia and Washington, D.C. Shoppers targets price-conscious consumers offering over 30,000 everyday low prices and a commitment to save up to 15 percent or more every day with no card needed. Shoppers offers exclusive coupons, savings and recipes, as well as all pharmacy needs. For more information, please visit www.shoppersfood.com.